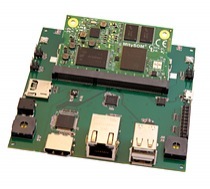 Gumstix, Inc and Critical Link, LLC have created a partnership to provide support for Critical Link MitySOM-335x COMs in Geppetto, Design-to-Order (D2O) platform. Gumstix custom expansion board for MitySOM-335x are available for purchase or users may build their own custom design-to-order expansion board in Geppetto D2O. 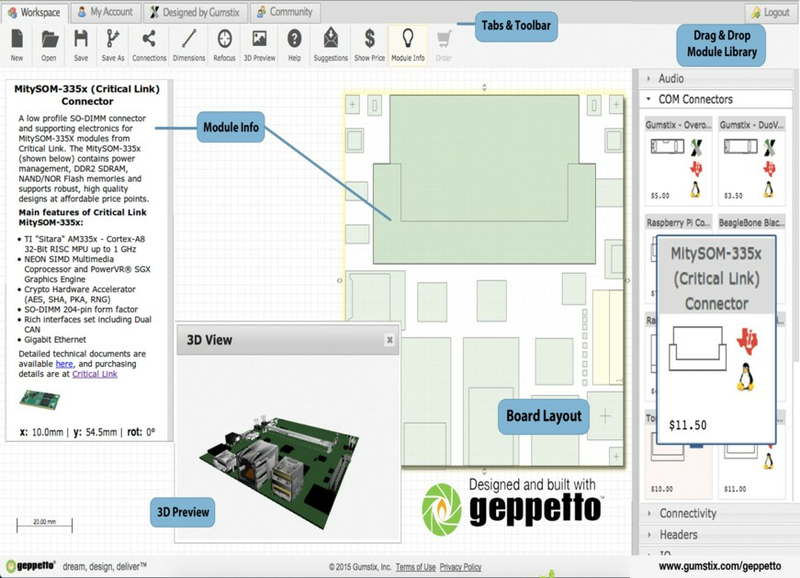 Design engineers are able to reduce risk, cost and design time utilizing the simple drag and drop online Geppetto D2O tool. REDWOOD CITY, Calif. March 24th, 2016 — Gumstix®, Inc., the leader in design-to-order embedded systems, today announced a partnership with Critical Link, LLC to provide support for Critical Link MitySOM-335x COMs in Geppetto® Design-to-Order (D2O) platform created by Gumstix engineers. Using Geppetto® D2O, customers can rapidly design and manufacture small form-factor boards custom tailored for industrial applications that require the versatility of the MitySOM-335x powered by the Texas Instruments Sitara™ AM335x family of processors. 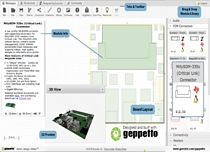 Once customers are satisfied with their expansion board designs in Geppetto® D2O, engineers at Gumstix will test and validate the board design, manufacture and ship the production ready board 15 days from order; reducing both the production and development time for the customer. All Gumstix products and quantity discounts are available at www.gumstix.com. Gumstix, Inc. and Critical Link are members of the TI Design Network, a premier group of independent, well-established companies that offer products and system-level design and manufacturing services complementing TI’s semiconductors to a worldwide customer base to accelerate product innovation and time-to-market. Network members provide product design, hardware and software system integration, turnkey product design, RF and processor system modules, reference platforms, software development, proof-of-concept design, feasibility studies, research, certification compliance, prototyping, manufacturing, and product life cycle management. For more information about the TI Design Network, please visit www.ti.com/designnetwork.